Fung Ming Chip (b. 1951, Guangdong, China) is a Hong Kong-based artist who is active as a painter, photographer, playwright, sculptor and poet. He was raised in Hong Kong and moved to New York in 1977. Since 1986, he was shuttling between New York, Hong Kong and Taiwan, and finally settled down in Hong Kong in 2006. Fung is a self-taught artist rooted in Chinese tradition, training, and discipline. He is dedicated to innovation and explorations of continuity and transformation. For Fung, calligraphy - an art of time, space, and movement - is closer to music and dance than to Chinese literature. The structure of the character becomes the choreography for his brush. Notably, out of his many international exhibitions, Fung held a major solo retrospective at the Taipei Fine Arts Museum in 1999. He was artist-in-residence at Cambridge University in 2004 and in 2008 he created a Les Poemes du Mandarin tableware pattern for Hermes. His work is included in major private and institutional collections around the world, such as Ashmolean Museum (Oxford University, England), Hong Kong Museum of Art (China), Israel Museum (Israel), Metropolitan Museum of Art (USA), and the White Rabbit Collection (Australia). Fung Ming Chip always loved calligraphy, but after much practice he decided that in an age of ballpoint pens and keyboards, it was impossible to match the brush skills of the old masters. His response was not to abandon his chosen art but to reinvent it. Calligraphy is inseparably tied to language: without this, it is little more than abstract painting. This anchorage in Chinese tradition has helped calligraphers resist the homogenising winds of modernity, but also kept them from responding fully to change. Fung Ming Chip bridges the divide, giving calligraphy new life and meaning by digging deep into its origins. He experiments endlessly: breaking the connections between strokes; violating the conventional order of strokes; writing on the back of the paper to create mirror images. 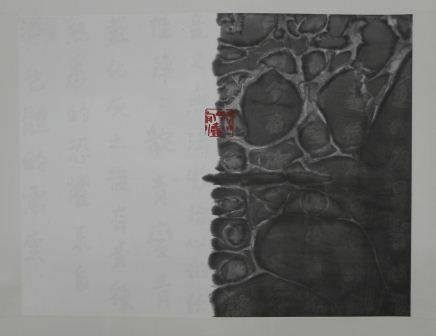 He "opens up" characters so their internal spaces merge with the space around them, and plays with the absorbency of traditional xuan paper, which makes initial strokes seem to float above all strokes superimposed on them. 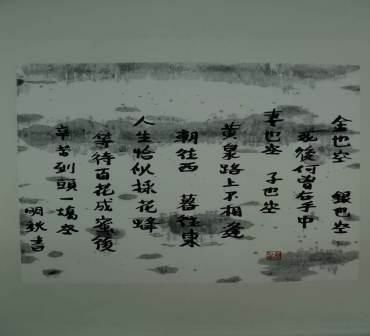 He has developed his own script styles, such as the looping, cursive "swirl script", the scattered "bamboo script", and the "sand script" of Departure (2010), in which ink dried to a powder is blown across characters rendered in barely-inked water, adhering at random to the still-wet strokes. These scripts are used to write not only Buddhist sutras but poems with titles like Post-Marijuana and Prostitute. 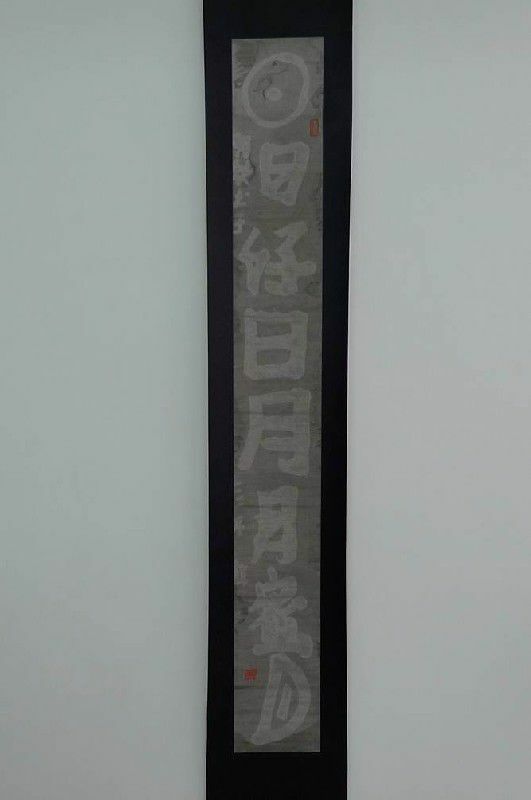 With a daring liberation unheard of in traditional calligraphy, Fung Ming Chip pays true homage to its spirit.